Track Listing: CD 1: 1. Take A Chance / 2. On The Loose / 3. Help Me Out / 4. Keep It Reel / 5. Time's Up / 6. Will It Be You / 7. Careful Where You step / 8. Frog Bite (Drum Solo) / 9. What's It Gonna Be? 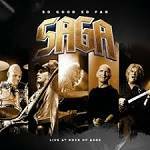 More information: Featuring the most iconic of songs that SAGA has been known and loved for by fans for 40 years, “So Good So Far” delivers the epitome of SAGA's long and proud band history all recorded at the Rock of Ages festival in Seebronn, Germany in 2017. In front of thousands of festival goers the headliner of the evening played an energetic 1.5 hour set featuring the best of 21 SAGA studio albums on both audio and video.